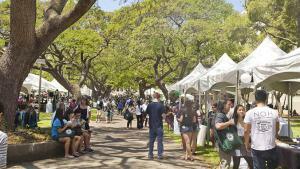 The number of undergraduate applications to the University of Hawaiʻi at Mānoa this year shattered the previous record set last year. The UH Mānoa Office of Admissions reports it received nearly 19,000 undergraduate applications, a 33-percent jump over last year’s record number. UH Mānoa received nearly 16,000 first-year applications for admission to the 2019 fall semester, a 66-percent increase over last year’s record number of freshman applications, which lead to the largest freshman class in the university’s 111-year history. “Our work is far from over, the increase in applications shows that the word is out about UH Mānoa being one of the world’s great research institutes for higher education, making it an attractive option for students on a local, national and international level,” said Assistant Vice Chancellor for Enrollment Management and Director of Admissions Roxie Shabazz. Among the many effective recruitment initiatives is the Mānoa Experience. This year, more than 1,880 current high school seniors and juniors, their families, school groups and transfer students from Hawaiʻi and 24 other states attended the annual open house to learn about what UH Mānoa has to offer, go on campus tours or check on their application status. The Mānoa Experience is just one of the many events that builds momentum during the busy recruitment period. During March, the admissions office will host accepted student receptions in California, Washington and Colorado, and in April there will be receptions on Maui, Hawaiʻi Island, Oʻahu and Kauaʻi. In addition, the Mānoa Scholarship Awards weekend will be held April 5–6. The Mānoa Scholar-to-Scholar Day on April 5 is when scholarship awardees (Regents, Chancellor and Excellence) shadow a current scholar on campus. They will attend classes, take tours, have lunch, and get to know what it is like to be a UH Mānoa student/scholar for the day. The following day, Saturday, April 6, scholarship awardees are formally recognized at the Mānoa Scholarship Awards reception at ʻAlohilani Hotel. Rounding out the receptions, will be a final series of high school visits, as well as one-on-one sessions locally, in select cities on the continental U.S. and internationally. The sessions cover topics including transitioning to college life, housing options, the registration process, travel opportunities and new student orientation. UH Mānoa is consistently ranked in the top five percent among national and international universities and is almost $3,000 below the national average for instate tuition for a public university. Find out how to Make Mānoa Yours.